A simple conversion for a Glimåkra with an Opphamta attachment. Shafts that tilt drive me crazy. I have been contemplating how to fix the problem for some time. This is a simple modification I have done that has resulted in absolutely horizontal lifts perfectly every time. I have a small Glimåkra with a draw attachment. The original draw system is shown by the blue line below. 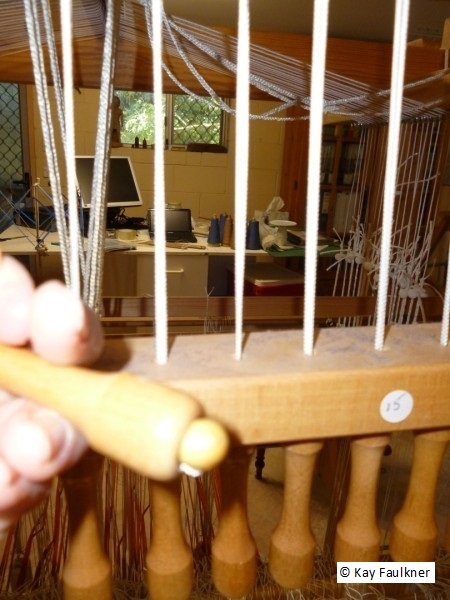 On my loom the spacer of the comber board is horizontal. I have seen others where it is angled. These instructions will probably need to be adjusted to accommodate any variation in angle. 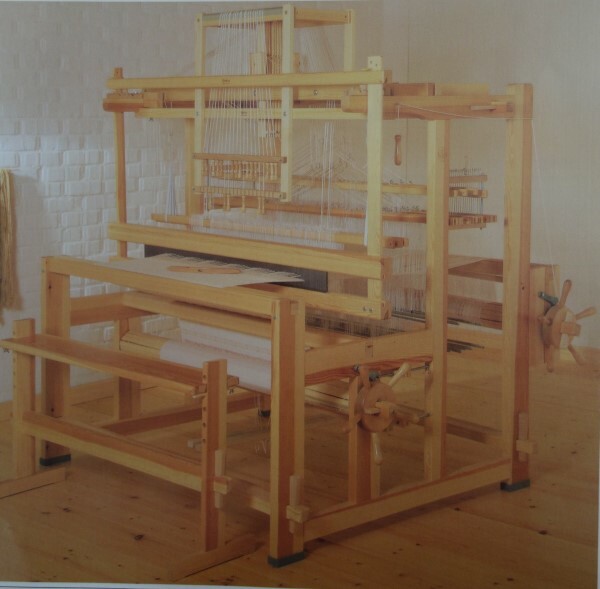 The original loom looked similar to this. The basic principle is to convert the central single cord pull to one that employs 2 vertical pulls one from either side of the shafts i.e. changing the blue cord angles to the direction of where the red is marked. 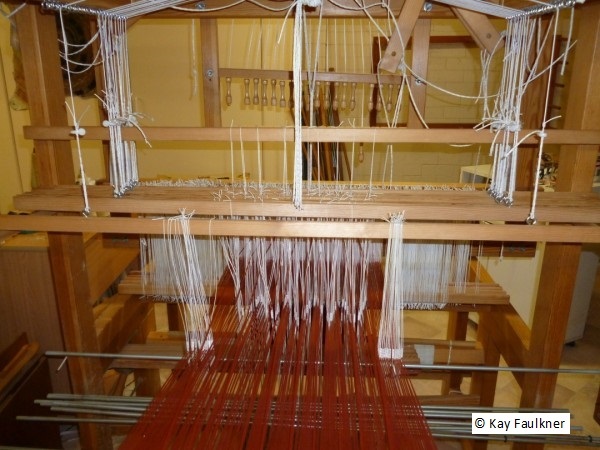 The diagram shows the top section of the loom only. Obviously a means of suspending the red cord in its new position will be required. 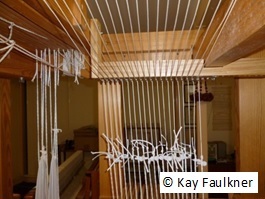 On the whole I have retained the original pull method using in the main existing structure. The only physical modification is with the construction of and attachment of two structures that redirects the angle of the cords from the shafts. This structure will need to be positioned between the mid cross beam and the back crossbeam. It will also need to be below the level of the existing spacer. The structure will need to have a means of directing the cords. Rather than holes drilled in wood, I have used screw eyelets as they will have less resistance when the cords pulled and will also have less wear on the cords. 4 x 4 cm length and 4 x 2 cm length of pine or equivalent. The left hand side will be attached to the mid cross beam while the cut out section fits under the back cross beam. The second structure mirrors the first. 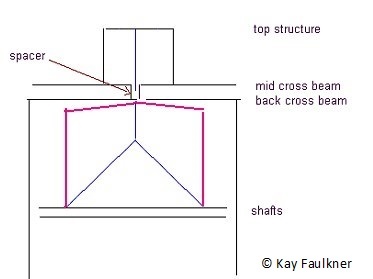 Measure the distance between the centre and back cross beams, add 18 cm. I made sure that when completed the lengths would not be in the way. I have actually added more than is required because I am contemplating doing a further modification to add more shafts later on. It could be a little shorter and just fit past the back cross beam if desired. Cut 2 lengths. Calculate the length of the vertical piece of 4 x2 cm. The aim is to have the structure sitting horizontally when completed (see following diagram). I held the 4 x 4 length in position with a level to calculate the distance required, keeping in mind that I would be cutting out a section to fit over the back cross beam. 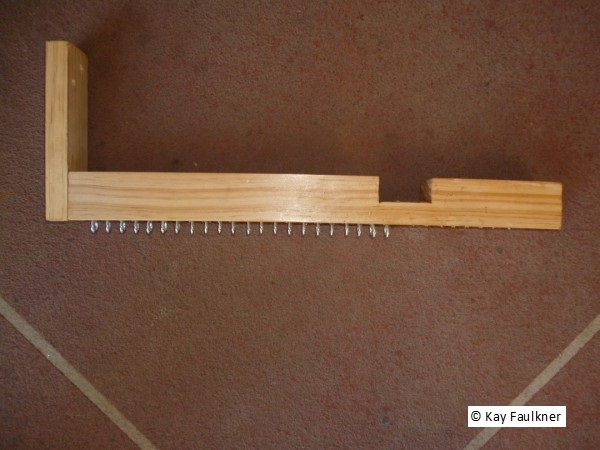 Use 2 screws to join the 2 pieces of wood. The position of the eyelets is identical to that on the existing central spacer. I measured where the first space was on the central spacer and drilled a hole for the first screw. Then as each gap on the spacer was ½” apart, the consecutive holes were also drilled this distance. The holes were drilled 1 cm from the inside edge. This was to ensure there was no danger of the cords abrading if they rubbed on the edge of the wood. Once all the holes were drilled, I attached the screws. I have ensured that each screw is aligned at right angles to the length. Now it is a simple matter of replacing the cords. 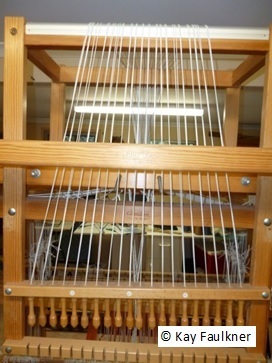 The cord will follow the same path as previously at the front of the loom and over the top passing through the spacer. It will then divert through the new screw eye and then down to the shafts. 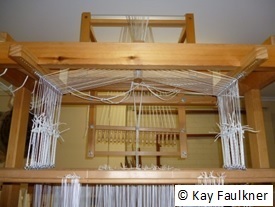 I have used a system that allows for minor adjustment to the cord lengths so that the height of the shafts can be altered if required or the shafts disconnected. It’s also a great system as I can swap around the pattern heddles at will. The shafts will need to be held in their required position by some means. 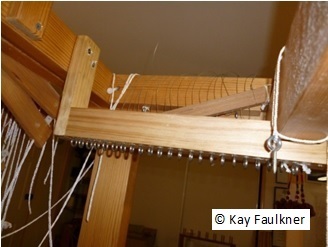 I have tacked on supporting length of wood that the shafts can rest on. This ensures that the shafts won’t move while I am adjusting cords. If necessary it can also be removed at a later date. The cord will need to be used doubled. I threaded a small bead on the cord then passed the two ends through the toggle making sure that the cords were the same length. The bead prevents the cord from pulling through. Then position the cord at the front and over the top as previously. Pass the 2 cords through the spacer as it was previously done. Separate the cords. One will go to the structure on the left, the other to the right. Thread the cord through the eyelet from the front to the back. Measure 15cm or 6” Above the desired height of the shafts, mark this position and knot a loop to this height. 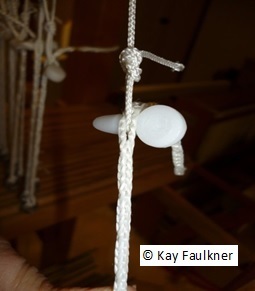 On the shaft, attach a small length (20cm) of texsolv cord to each of the screw eyes. Pass the knotted loop of the venetian cord through the texsolv cord and secure with a plastic toggle at the required height. Side view of the modification showing structure and cords. 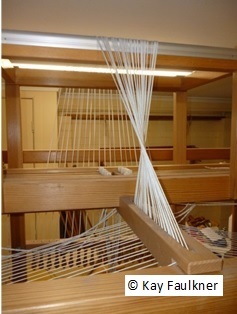 Looking up at the draw system at the back of the loom. And finally here is the proof. Here are 2 shafts raised… absolutely level and horizontal.